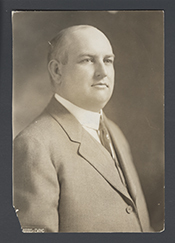 IGOE, William Leo, a Representative from Missouri; born in St. Louis, Mo., on October 19, 1879; attended the public and parochial schools of St. Louis and was graduated from the law department of Washington University at St. Louis in 1902; was admitted to the bar in the same year and commenced the practice of law in St. Louis; member of the municipal assembly of St. Louis from 1909 until March 3, 1913, when he resigned to enter Congress; elected as a Democrat to the Sixty-third and to the three succeeding Congresses (March 4, 1913-March 3, 1921); declined to become a candidate for renomination in 1920; resumed the practice of law; unsuccessful Democratic nominee for mayor of St. Louis in 1925; chairman of the St. Louis Board of Police Commissioners 1933-1937; died in St. Louis, Mo., April 20, 1953; interment in Calvary Cemetery. Thompson, Alice Anne. The Life and Career of William L. Igoe, The Reluctant Boss, 1879-1953. Ph.D. dissertation, St. Louis University, 1980.